1. Heat McCain Sea Salt and Garlic Mini Roasts as per the directions. 2. Cut up bacon into small pieces and gently cook in the fry pan until crispy. 3. 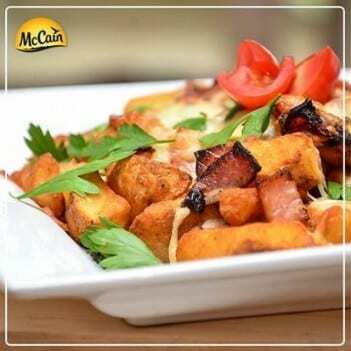 When potatoes and bacon are cooked, take the potatoes out of the oven on a tray and move them to an oven proof serving plate. 4. Once potatoes are on the plate, sprinkle with finely grated cheese and bacon, then place them back into the oven on 180 degrees C until cheese is melted. 5. Take them out of the oven, sprinkle with a garnish of parsley and then top off with a chopped tomato. If you like it hot - you can also add some chilli if you wish! 1 Heat McCain Sea Salt and Garlic Mini Roasts as per the directions. 2 Cut up bacon into small pieces and gently cook in the fry pan until crispy. 3 When potatoes and bacon are cooked, take the potatoes out of the oven on a tray and move them to an oven proof serving plate. 4 Once potatoes are on the plate, sprinkle with finely grated cheese and bacon, then place them back into the oven on 180 degrees C until cheese is melted. 5 Take them out of the oven, sprinkle with a garnish of parsley and then top off with a chopped tomato. If you like it hot - you can also add some chilli if you wish!